At the Math Museum, we think it is important to challenge yourself with mind-expanding tasks. Here are two rather challenging constructions which look simple but may stymie you for hours. When you are done, you’ll have something unique to show your friends. 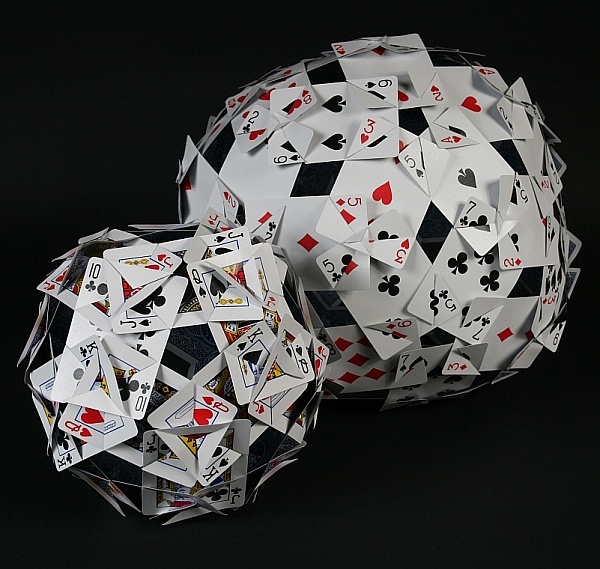 The ball at left is made of thirty cards and the one at right uses sixty. Two decks of cards, a pencil, and a pair of scissors are all that is necessary. Because of the tricky interlocking pattern, they hold together without tape or glue. If you want to polish up your maker skills, try slicing up two decks of cards using these templates, then just slide them together. Detailed directions and mathematical background are available here. Francesco de Comite has taken this idea and gone wild with it, rendering many other possible patterns here. Most have not yet been built, so you can try to be the first to make some. This article first appeared on Make: Online, December 14, 2009.